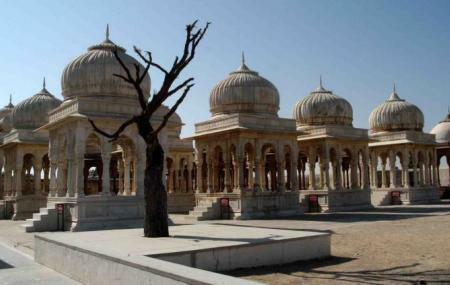 Atop the small hill in Bada Bagh there are a set of Cenotaphs of the Maharajas of Jaisalmer. The carvings of floral patterns, peacocks and human figures are very beautiful and intricate. The feel too is a bit eerie as they stand alone calmly on the hill top. Every ruler that ruled from the 15th century starting from Rao Kayanmal (1542 to 1571) to Karni Singh (1950-1988) is standing there. The architecture is blend of Rajasthani and Mughal styles. Carry a camera and water bottle. How popular is The Royal Cenotaphs? People normally club together Karni Mata Temple and National Research Centre On Camel while planning their visit to The Royal Cenotaphs. This is an historic and beautiful place near bikaner .And the surrounding is good.but there have no market near by so you can take own food or water .this is a peaceful place where you relex your mind . Located at a distance of 8 km from the Bikaner city, Devi Kund or Devi Kund Sagar is a collection of Cenotaphs (Chattris), an amazing proof of classic Rajputana style of architecture that has been mixed with Islamic architecture. These chattris are made of white marble and red sandstone and are decorated with intricate carvings. Originally a royal crematorium, Devi Kund was erected in the memory of the deceased members of the royal family of Binaker. It's very nice n soothing place.